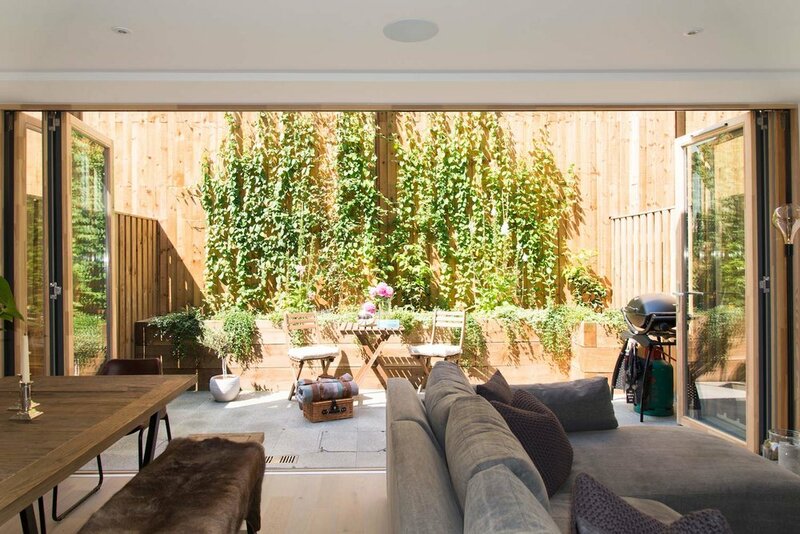 The brief for this project was to transform a blank canvas new build into a fun family home. 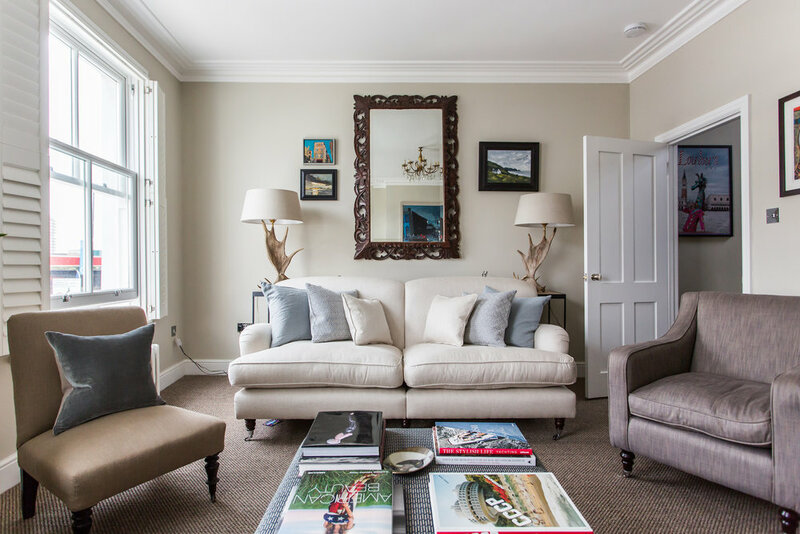 The high ceilings and large windows are a great assett and we worked to highlight these features, while adding enough colour and texture to each space to make it feel cosy. The long open plan kitchen is the first room you see as you walk through the front door. We added two large bespoke pantry cupboards providing invaluable storage, drawing your eye down the room. A vintage country dining table was sourced with an eclectic mix of chairs bringing together the colours throughout the room. The children have a cosy reading area with their own table set and play area. The sitting room is a great size and to accentuate this we really played with proportion here. The big comfortable L shape sofa provides plenty of seating for the whole family and the bespoke ottoman was made with storage for blankets and cushions. We used a pair of huge ceiling lights which perfectly highlighta the art wall, filled with family photographs, postcards and art collected over the years. 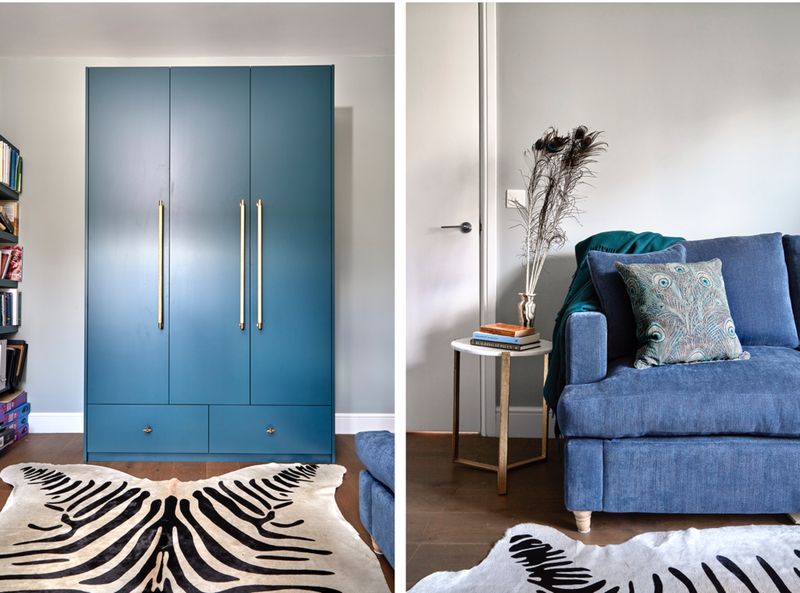 Darker colours were used in this room and along with the clients mid-century side board and some added bohemian accessories it has created an eclectic scandinavian feel in here that will evolve and develop with the family. The guest bedroom already had a bed, so we created a fun scheme around this with bright bone inlay side tables, moroccan lighting and House of Hackney cushions. This room doubles up as a study with a desk on the other side of the room and a view of the Shard out the window framed with fringe detailed curtains. The childrens bedroom brief was to create a comfortable, fun room that the children can practise Montessori principles everyday. The joinery unit was designed with open baskets at reaching level, the baskets are filled with different toys and games so they can choose what to play with. A selection of vintage frames were painted, adding string and pegs to each frame. This encourages the children to choose the art on their walls, easily swapping what they have on display when they create new pieces. Stackable single beds with pretty handmade sheets means it's easy to accomadate sleepovers with friends and cousins. The walls were adorned with fabric stickers which can be removed and re-arranged without leaving any marks. The lovely rug in this room is made in England using recycled plastic bottles. The master bedroom had such a lovely big proportion, so it was important to really fill the room with appopriately proportioned furniture. The vintage persian rug has wonderful depths of colours and frames the statement blue velvet bed. Chest of drawers are used as the side tables with a dressing table in the same style sitting opposite. A handmade English oak bench was commisioned for the end of the bed to place cushions in the evening. Two large bespoke wardrobes provide ample storage and make a real statement with their brass peacock handles. 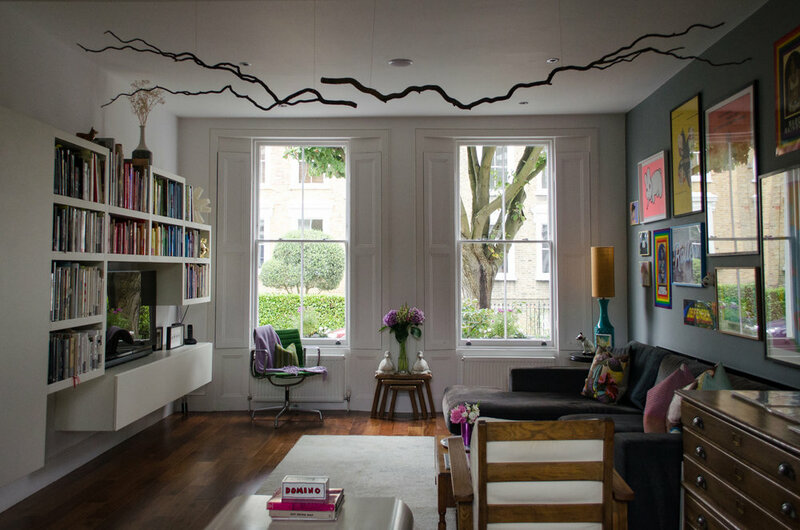 The brief for this project was to create an eclectic interior in a small Victorian conversion that maximises the usable space. My client wanted a home that reflected her personality and interests, she loves bold jewel colours and her passion is singing. 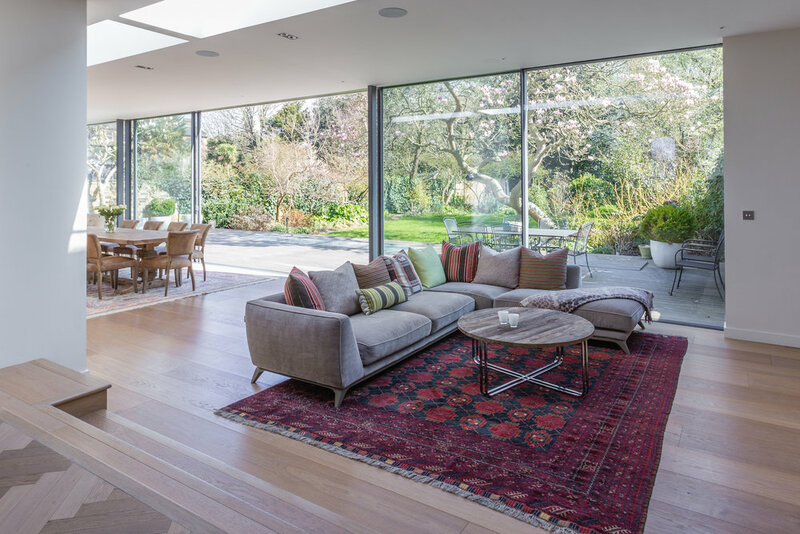 The living room has a bespoke coffee table that folds out into a dining table, lightweight armchairs were specified so they can easily be moved next to the piano when the room is used for a dinner party to enjoy the piano. An artisit was commissioned to create the trio of paintings of my clients favourite church windows where she sings in the choir. 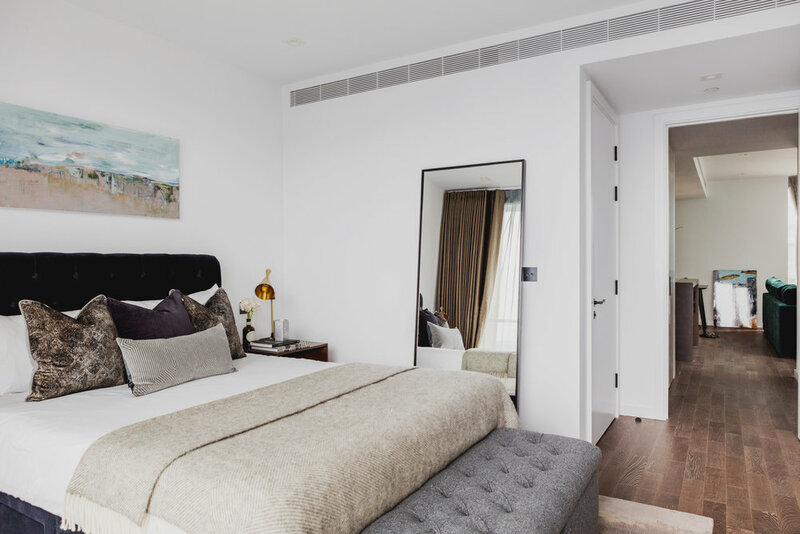 A second bedroom was required for friends to stay but a study was more of a necessity on a day to day basis, the room functions as both. With bespoke joinery for books and extra bedding, and a very comfy sofa bed this room can easily become a second bedroom when needed. 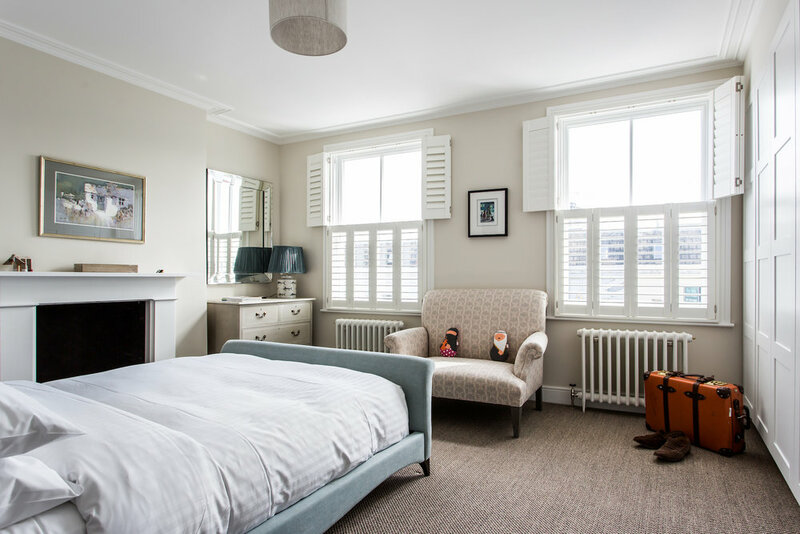 The master bedroom in this converted Victorian flat is a long room in the eaves of the building, there is a central wardrobe to segregate the space slightly and ensure the bed is facing the pretty window. Antique mirror was added to the walls to open up the space and increase light flow to the back on the room. "I was introduced by a friend shortly after buying a flat and starting from complete scratch and overwhelmed at where to start, Natasha was a delight to work with at every stage. She had the right balance to push me out of my comfort zone. 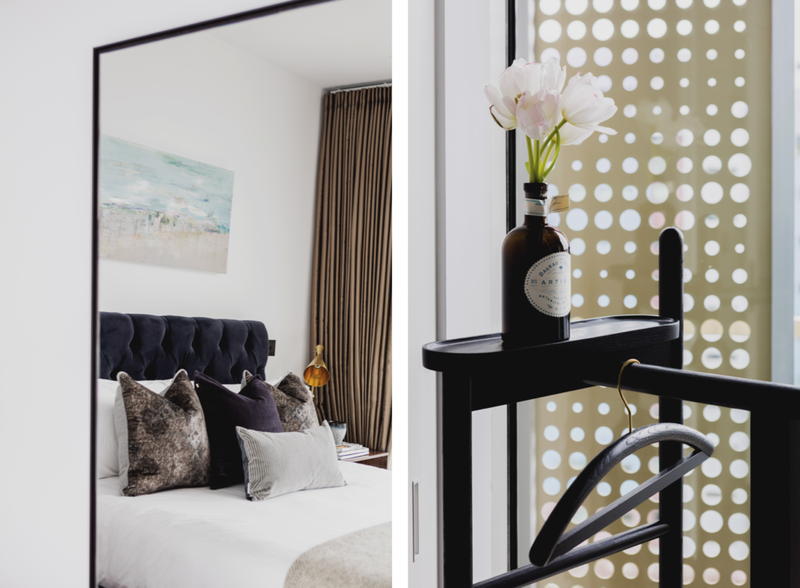 I have been enjoying my beautiful home for almost a year now and know for sure, without Tash I would still have white walls and bits of old furniture whilst trying to decide what to do!" My first solo kitchen design and installation. 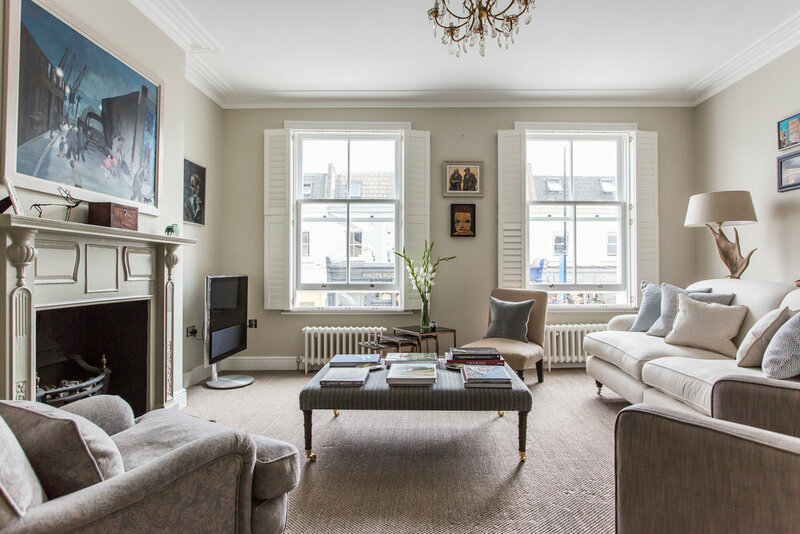 In a handsome Edwardian home in Angel the space comprises beauitful architectural detail with full height bay windows, intricate coving and original doors. The client loves Scandanavian interiors and wanted a kitchen that was highly functional, without looking too much like a kitchen. The white units, with white caeser stone quartz worktops, creates a calm space to be in with all the mod cons cleverly concealed in the joinery design. This was a test in trying to create a modern, minimalist kitchen in an old building, being mindful of the history and makeup of this wonderful home. The brief was to create a bold, masculine scheme that captures the essence of the iconic development, Battersea Power Station. The furniture scheme was designed for luxury rental. 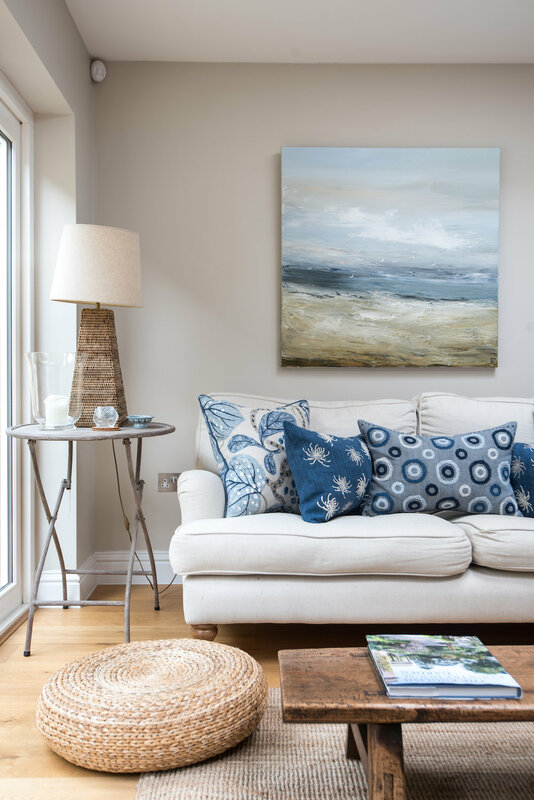 A special space in a pretty cottage in West Sussex. The room was designed for Airbnb rental using natural, sustainable materials. The African portraits were drawn by the owner at art school, the bed was found in a junk shop in France and had a long journey by car, ferry and train to get a new lease of life with the beautiful eucalyptus printed linen. The side tables have been re purposed with organic milk paint and the finials sourced at a local market. The brief was to furnish this newlyweds open plan living area in an urban industrial style with all focus on the green patio. The totem was a wedding gift, carved from a 150 year old piece of wood from an artist in Germany, it's the star of the space. Mine and Eddy's quest for a home started on wheels. There is a liberating sense of freedom that comes with having a space that moves with your life. 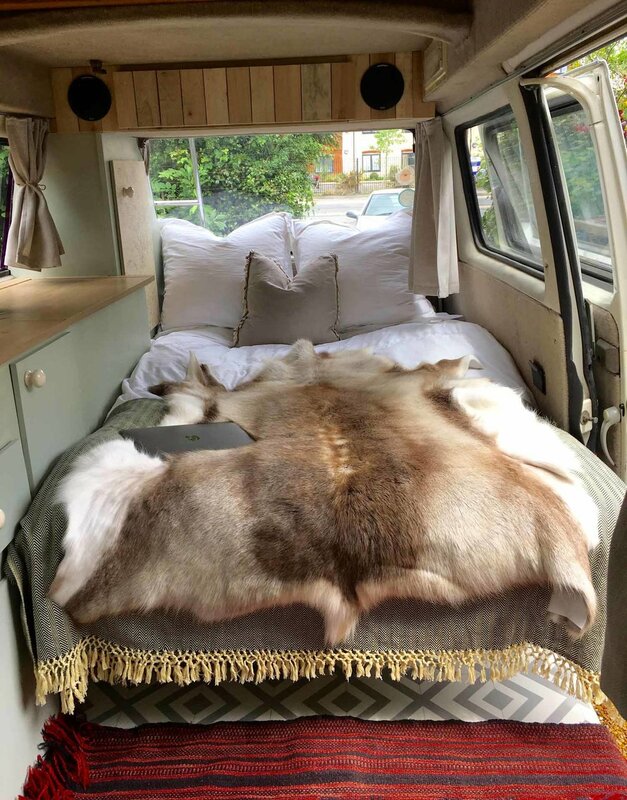 A camper van encompasses a self sufficient, sustainable and adaptable way of life that we really value. Here are two of the camper vans we have designed and built internally from scratch. My portfolio of interior styling and creative direction over the years for interior magazines, lifestyle shoots and home tours. Mine and Eddy's first design and build duo project- images coming soon. This proect in in progess and will be uploaded very soon!